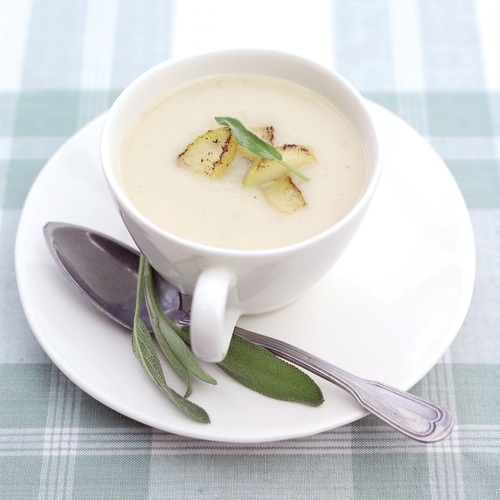 Sweet parsnip and tart cooking apples form the perfect partnership for a tasty soup fit for bracing winter temperatures. With only 10 minutes preparation time, this warming soup also offers a low calorie option or a creamy comparison dependent on the mood. 1. Melt the half butter in a large saucepan and add the dessert apple slices. Sauté until lightly browned, remove and set aside. Melt the remaining Loseley Summer Meadow Butter and add the parsnips and cooking apple. Cover and cook gently for 10 minutes, stirring occasionally. 2. Pour the stock into the saucepan and add the sage and cloves. Bring to the boil, cover and then simmer for 3o minutes, until the parsnip is softened. 3. Remove the sage leaves and cloves, then puree in a blender or food processor. Return to the saucepan and reheat gently with the cream. Season to taste. Serve hot, garnished with the sage leaves and apple slices and serve with granary bread. If you prefer, use ½ tsp of dried sage when cooking the parsnips. For a lower fat version, simply omit the cream – the soup still tastes really good.